I insist that I’m not too much of a materialist, but I must face the fact that there are certain things that get my eyes watering and my palms sweaty. A fine and functional handbag is one of those things. And by the way, my husband is happy it’s not Ferraris and Lamborghinis. Not that either or all are in our budget, but a girl can still dream. The truth is that none of the clutches or purses I’m writing about today are used as a practical item. They are more of a symbol to show off how much money the owner has. After all, if you’ve earned it, you should be free to show it off anyway you want. If someone has a million dollars plus to spend on an evening clutch to top off their one of a kind ensemble, then it’s very likely they are also very active philanthropists. Who is to say? I’m writing about handbags. 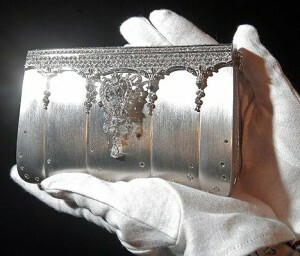 A very popular bag for the person who wants to make an elegant and eye splitting appearance comes in at $1.9 million. The Hermes Birkin bag by Ginza Tanaka cannot be mistaken for anything other than top of the line.The outer shell displays over 2,000 diamonds and the metal work is platinum. To be sure the customer is getting her money’s worth the bag comes with a diamond sling which can also be used as a bracelet or necklace. The centerpiece is an 8-karat stone mounted in platinum filigree and can be removed and used as a brooch. Hey talk about versatility and money well spent! I t’s been said that those who have the most money are always trying to outdo each other. The guy with the big yacht is always playing at outdoing the fellow with the bigger yacht. So why not the same when it comes to accessories for his woman? Not to be outdone, strutting a Mouawads’ 1001 Nights Diamond Purse also known as the Guinness World Record holder as the most expensive bag in the world, will certainly put you in the lead. 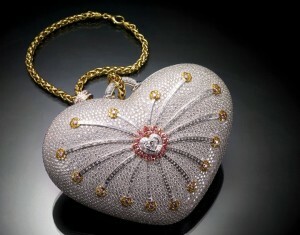 Priced at $3.8 million this one of a kind bag is the end work of 10 artisans working close to 9,000 hours. It’s a little heart shaped ditty hammered from 18-karat gold with 56 pink diamonds, 105 yellow diamonds and 4,356 colorless diamonds. No special sling or detachable brooch for the additional 1.9 million, but that’s not the point. Even the 1% who would use their money to have the bragging rights to a one-of-kind evening clutch would no doubt look at something a little more reasonably priced for daytime excursions. 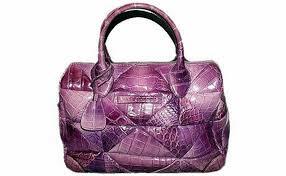 A Marc Jacobs Carolyn Crocodile handbag is a smart choice at only $38,000. Crocodile leather segmented exterior is stylish and the interior is designed to keep even the busiest of millionaires organized. I veered off my usual beaten path in today’s article – I couldn’t resist. Seeing the world through the bank account of a wealthy clutch toting millionaire was a journey I thought would be fun to take. Tomorrow’s article will be back in line with the rest of the world and us everyday Josephines, who love a good bargain without sacrificing style. What are your thoughts? Would you spend thousands or a million dollars on a handbag?